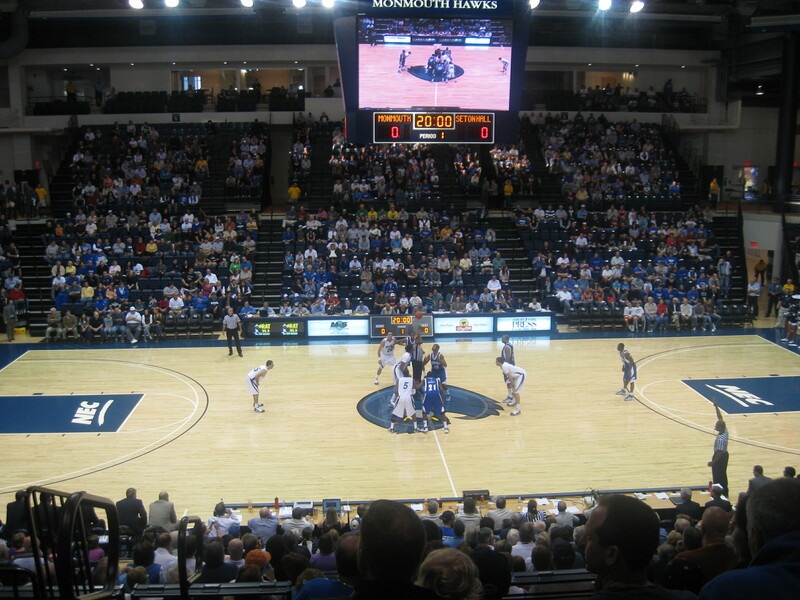 The trip to West Long Branch to see Monmouth University’s new arena went very well. The Hawks hung in the game for the first ten minutes, but Seton Hall gradually pushed it out of reach. I was rooting for the Hawks not only because most times I side with the Sub Red-Liners. Plus the Hall comes across as arrogant along with their over-expressive coach Bobby Gonzalez. I know being Syracuse fan, I should ‘root’ for my conference, but I can’t stand most of the Big East teams (Conncocketicut, Pitt…etc). Anyway, the building is beautiful and seems to be much better than old Boylan Gym. They made the arena intimate with seats extremely close to the court and you could tell it certainly could get loud. It’s just too bad Monmouth fans didn’t feel that energized to keep loud and TRY to rattle Seton Hall. The layout is a bit awkward, but it is great that they put the indoor track on the top level and not near the playing court. That way it feels like a true arena. The scoreboard was beautiful too and they never used the video in a distracting way. I think they were still working out some of the opening night kinks as it took me forever to find where the programs were sold (hidden behind the stairwell when you first walk in). Also, the ticket procedure was a little strange. I also hope they get some banners up in that place! That better not be an oversight, because they should proudly be hanging there conference championships. All-in-all, the MAC is a decent, new arena. I enjoyed my game there and the building has some very good features. It certainly is light-years ahead of its NEC counterparts and likely will help Monmouth basketball with recruiting.